Have you ever dreamt of spending your day at the office for fun instead of work? Have you ever been tempted to take a “game” break to clear your head and recharge your batteries? What if it were possible to have fun while working? How can we integrate playful dynamics into business tools in order to create an enjoyable user experience? Making work more fun and entertaining is the basic idea behind gamification. This term has become a buzzword today and is sometimes misused by companies who don’t always know the underlying theories of motivation. Gamifying working tools is not just about getting your salesforce to think, for example, that they are playing video games instead of filling in customer lead data. It’s more a matter of slowly and subtly introducing gaming mechanisms to make users want to use the CRM software they have to use on a daily basis. Immersion, the feeling of success, and wanting to belong to a community are all levers that can influence human behavior. An interface that offers challenges and rewards our success responds to a basic human need to feel appreciated. These elements motivate the user to use the tool and therefore be more productive. How can we gamify software? The cost of gamifying an existing tool is often much lower than that of creating a serious game. Gamification can be implemented little by little, as shown in the following example. Imagine we wanted to gamify Photoshop to help users learn the tool and discover new features. 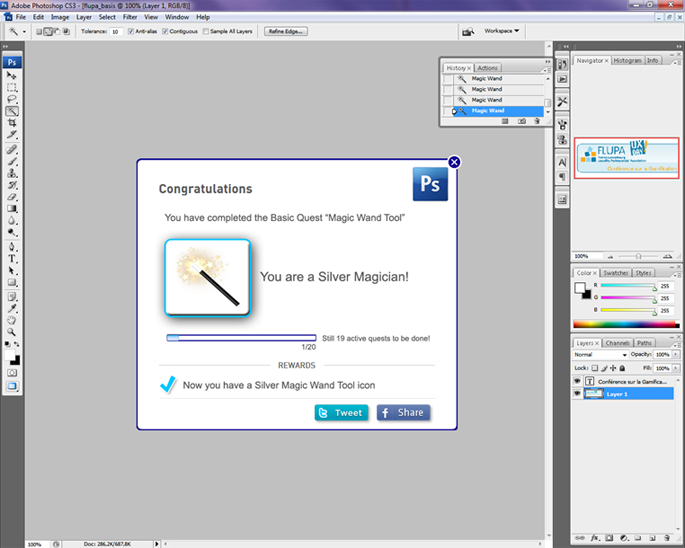 Photoshop detects when the magic wand is selected and used. When the system detects the first use of the “magic wand” function (via a built-in cookie), it rewards the user. Gamified Photoshop congratulates the user. 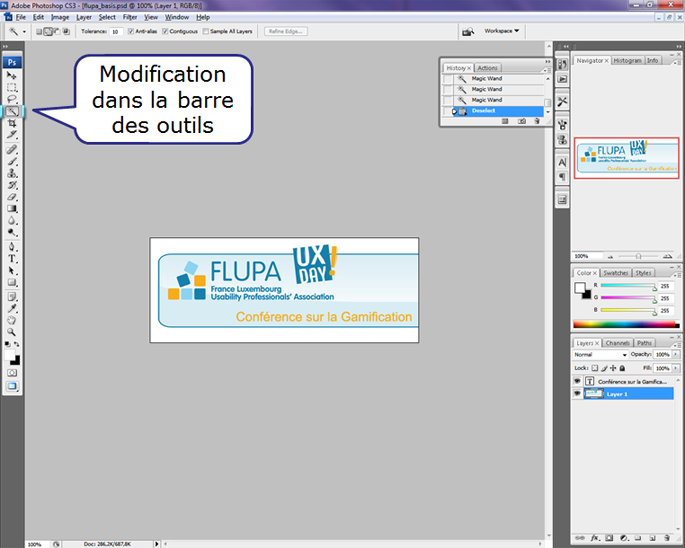 The resulting badge is the reward for having learned how to use the tool. Better still, levels keep on progressing. Badges that are more difficult to obtain (and therefore more rewarding) loom on the horizon, motivating the user to explore further. Finally, the toolbar will keep a visible trace of the badges acquired by the user. This shows the user level and encourages him or her to explore the software even further. The Photoshop toolbar changes after being rewarded. Identifying the right levers amongst many is essential. Older people are not motivated by the same things that younger people are. Likewise, men and women like different kinds of challenges. A good gamification that improves the productivity of users, their motivation, and job satisfaction is not a one size fits all affair. A “gamified” application is not a game. Gamification means applying game mechanics to something that is not a game. Oftentimes, gamification is wrongly limited to implementing points or badges and fails to take into consideration all the other mechanics that make a game enjoyable. We appreciated how motivated the team was and how quickly they understood the strengths and weaknesses of our platform. The success of our prevention project depended on it being able to raise awareness and motivate people to adopt new, healthy lifestyle changes. Design, fun, and simplicity were what we wanted to focus on to get there. LudoTIC did some extensive research and came up with the most relevant proposals to implement.